The first novel in Ray Banks's highly acclaimed Cal Innes series. Cal Innes is fresh out of Strangeways, playing PI and running from a past muddied with ties to local ganglord Uncle Morris Tiernan. When Tiernan tells him to track down a rogue casino dealer who's absconded with a hefty chunk of cash, Innes is thrust into a cat-and-mouse game with Tiernan's psychotic son. Finding the thief proves potentially fatal as the case points north to Newcastle and the sordid truth threatens to put blood on his hands. With Tiernan's son on his tail, and a Manchester cop determined to put Innes back on the spurs, Saturday's child definitely has to work hard to keep living. WARNING: this book contains quite a bit of swearing and is best avoided by those readers who find that kind of language offensive. "Tough and assured . . . Banks is updating the noir novel with an utterly original sensibility." "Bleakly, desperately funny, Ray Banks offers us a glimpse of what Samuel Beckett might have read like had he turned his hand to crime fiction." 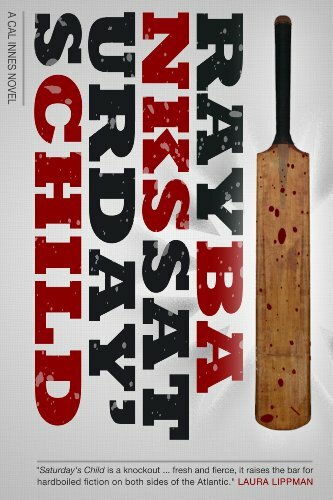 "'Saturday's Child' is a knock-out, written with the kind of energy and passion that far too few writers can muster. Fresh and fierce, it raises the bar for hardboiled fiction on both sides of the Atlantic." "'Saturday's Child' is fascinating, fresh and darkly funny. It will be an exotic entertainment for American readers of hard-boiled detective fiction." "Banks wields language with a knifefighter's precision, with much the same result. From the first words to the last, this book flashes brilliantly." - Don Winslow, The Power Of The Dog and The Winter of Frankie Machine. "Banks is part of the post-Rankin generation for whom hardboiled is not just a state of mind but a reality. Tough-guy colloquial prose and a pace fast enough to skin a rabbit, at the service of a tale of down-and-dirty realism: this is fiery stuff." "The writing's so urgent, so brutal, and just so obscenely real that it creates a whole new kind of 'dark' for a genre that's become a trifle stagnated in recent years. Hence this is a book anyone who's fallen out of love with the genre in these recent times, where the old quality has been severely lacking, simply needs to read." "...terrific, brooding and chilling prose"
"...a fine example of energetic, visceral and compelling storytelling... This is properly thrilling stuff."